If you follow the local (Pittsburgh) news, then you probably know that Steeler James Harrison's pit bull bit his toddler son, the mother of the child, and another person. The son appears to have had the worst of it, having spent about a week in the hospital. Apparently this two-year-old dog had never been aggressive before, but something in this young child's cry set the dog off. I have a pit bull, who, according to our vet, may actually be a pit bull-shar pei mix (who knew). Sadie has been with us since July 1, 2002, when I brought her home, with a little help from my friend Amy (whom we refer to as Aunt Amy, although Ame refers to herself as Aunt Mimi), from the Human Society. As some friends know, my plan was to get a dog or have a child. Not both. When we adopted Sadie, I told Brian that was it, no child (clearly, I changed my mind several months later). When I first saw Sadie, it was practically love at first sight. I thought she was cute, and then I moved down the row of dogs to see the other dogs. I saw another dog whom I also thought was cute, and again kept moving. When I got to the next dog, I realized it was the same dog who kept sneaking in and out of the openings. By then, I was hooked, only to realize "Shorty" was a dreaded pit bull. The cuteness factor coupled with her already being housebroken outweighed the breed type, and I chose to ignore her aversion to vacuum cleaners and a few other things. Sadie spent her first night in a crate downstairs, but since Bri and I both worked full time and were gone most of the day, I decided we should let her sleep in our room. 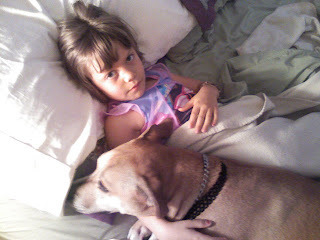 She started out on the floor, and we let her get in bed with us just before we got out of bed the next day. Within days, she would sneak in bed with us in the middle of the night. Probably a week or so into it, she would start jumping in bed soon after I fell asleep. Before long, we just let her sleep with us at the bottom of the bed. Eventually she actually slept between us. My boss at the time said she had a lot of time at home during the day to work on plan that would eventually enable her to sleep with us. I think he may have been right. I read that James Harrison is now considering letting his dog live, in the hopes the dog can be rehabilitated. I can understand that sentiment; for most pet owners, these creatures become part of our family. What would I do in that situation? Well, I know if Sadie ever seriously hurt Jordan, Brian would see to it that was the end of Sadie. Sadie has slightly bitten both me and Jordan; she tends to do this when I have the remote or a paper towel in my hand, and Sadie has also been known to chew a ball on my leg and include my leg in the gnawing. Obviously if she really wanted to hurt us, she could. But if Jordan had to go the hospital, could I live with myself knowing that Sadie could hurt another? I honestly don't know. In the meantime, I will keep hoping and praying that Sadie stays as sweet as she is and never really hurts us. I can also hope that she becomes a better dog, stops biting the remote out of my hand, etc., but as the saying goes, there are no bad dogs, only bad pet owners, which would be I.
Patron is getting a home. According to the P-G, a woman who specializes in rehabilitating pit bulls will be taking the dog, with the option of keeping him. I hope it works out. It was terrible for the dog to do that, but maybe it was a one-time fluke. Let's hope.